I haven’t been this excited about a pedal in a while. Last week I asked about a new pedal on the Yannis’ board from Foals. It replaced his Electro-Harmonix Nano Holy Grail, and I was surprised by the functionality available for this new reverb pedal. A few people commented and mentioned it was a Strymon blueSky Reverberator. I’ve seen a few Strymon pedals mentioned before, but I knew very little about the Blue Sky Reverberator, so I thought I’d hit YouTube to see what I could find. And.. I was pretty much blown away. For this video (posted by strymon), I’m only going to show the plate shimmer video. I was really impressed with the plate shimmer so I wanted to showcase that here. Love to try this thing out in person some time. There are a few dealers for Strymon, but the best bet to purchase a pedal is from their web store. 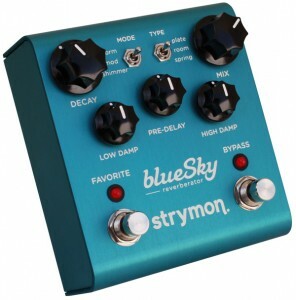 The Strymon blueSky Reverberator is available for $299.00.